Daniel Bunting (Nuffield student), Kentaro Yoshida and Diane Saunders at TSL. We used the C. fraxinea KW1 predicted proteome (data/ash_dieback/chalara_fraxinea/Kenninghall_wood_KW1/annotations/Gene_predictions/TGAC_Chalara_fraxinea_ass_s1v1_ann_v1.1) as a basis to mine for candidate effectors. First, the predicted proteome of C. fraxinea KW1 was searched for potential secreted proteins using SignalP2 with parameters described in . Transmembrane domain containing proteins and proteins with mitochondrial signal peptides were removed using TMHMM  and TargetP , respectively. We then clustered all proteins using TribeMCL , following the methods described in . We identified clusters of proteins (known as tribes) that contained at least one secreted protein. These 593 tribes were then used for all further analysis. 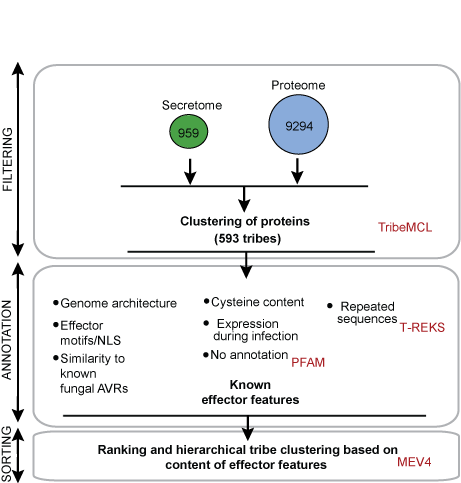 Next, we annotated the protein tribes for known effector features as described in . Finally, we assigned an e-value to each feature within a tribe using the method described in  in order to rank tribes based on their likelihood of containing effector proteins. A spreadsheet that contains the above analysis is available at (data/ash_dieback/chalara_fraxinea/Kenninghall_wood_KW1/annotations/Effector_mining). Figure 1. Pipeline used to mine for potential effector proteins in C. fraxinea KW1 isolate. Programs are indicated in red. 1. Torto TA, Li S, Styer A, Huitema E, Testa A, Gow NAR, Van West P, Kamoun S: EST mining and functional expression assays identify extracellular effector proteins from the plant pathogen Phytophthora. Genome Res 2003, 13(7):1675–1685. 2. Krogh A, Larsson BÈ, Von Heijne G, Sonnhammer ELL: Predicting transmembrane protein topology with a hidden Markov model: application to complete genomes. J Mol Biol 2001, 305(3):567–580. 3. Emanuelsson O, Brunak S, von Heijne G, Nielsen H: Locating proteins in the cell using TargetP, SignalP and related tools. Nat Protoc 2007, 2(4):953–971. 4. Enright AJ, Van Dongen S, Ouzounis CA: An efficient algorithm for large-scale detection of protein families. Nucleic Acids Res 2002, 30(7):1575–1584. 5. Haas BJ, Kamoun S, Zody MC, Jiang RHY, Handsaker RE, Cano LM, Grabherr M, Kodira CD, Raffaele S, Torto-Alalibo T, et al: Genome sequence and analysis of the Irish potato famine pathogen Phytophthora infestans. Nature 2009, 461(7262):393–398. 6. Cantu D, Seqovia V, MacLean D, Bayles R, Chen X, Kamoun S, Dubcovsky J, Saunders DGO, Uauy C: Genome analyses of the wheat yellow (stripe) rust pathogen Puccinia striiformis f. sp. tritici reveal polymorphic and haustorial expressed secreted proteins as candidate effectors. BMC Genomics 2013, 14:270. 7. Saunders DGO, Win J, Cano LM, Szabo LJ, Kamoun S, Raffaele S: Using hierarchical clustering of secreted protein families to classify and rank candidate effectors of rust fungi. PLoS One 2012, 7(1):e29847.